When my sons become bored of the waiting and they have long given up on watching an empty sky, we start the competition of ‘whoever spots it wins the prize’. But unless I come up with a worthwhile prize, the enthusiasm for being the first one to see them soon wanes and very easily the atmosphere can turn into the usual juvenile petty squabbles that are part and parcel of having two chalk and cheese sons like mine. The sun is still a hot golden glow about half way between its highest point of the day four hours earlier and its lowest point before it sizzles into the sea’s horizon in around another four hours. So it is in just the perfect position to make us scrunch up our eyes and give a half snarled mouth as we wince to keep our line of vision firmly fixed on as wide an area of the sky as possible. Straight hands with fingers stiffly bound together press against our foreheads, the bony long edge of the second finger pressing against the hardness of our skull as we try to block out the brightness of the sun by using our hands as a makeshift sun visor (should have brought that old baseball cap I never use). We sit on the cobbled bumps of Lyme Regis beach, the theatre end of the beach, you know the bit where happy dog owners are allowed to take their hairy friends for a romp and splash in the sea. Don’t ask me why we have sat on this part of the beach for the last two such occasions as we do not have a dog and I always make a point of warning sons 1 and 2 to look out for dog poo. But there you are, such are the oddities of (my) human nature! Then suddenly the shout goes up, not from my party of bored beach dwellers I might add, no; with our preoccupation of dog poo avoidance and asking son 1 to stop tormenting son number 2 as he throws stones under the guise of aiming for the sea but in fact throws them wide so they just narrowly miss younger brother; but from a casual observer further along the beach who had been relaxing in their folding chair without paying too much attention to anything in particular and able to see all through their very dark sunglasses topped by a sensible Tilley sun hat. “Here they come!” He says just a little too loudly to make the point that he has seen them first without the slightest effort of competition or prizes offered. And sure enough they blast across in front of us. 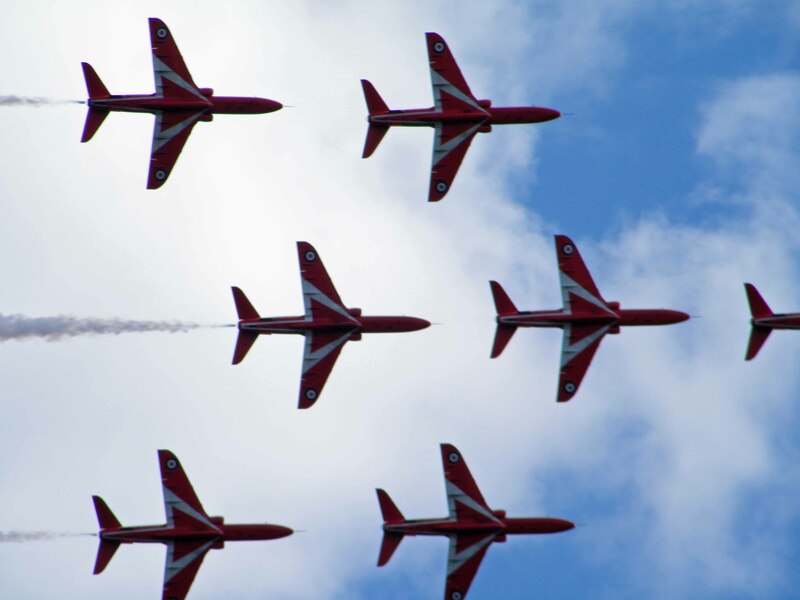 The seven members of the Red Arrows Display Team in all their powerful red, white and blue glory. Flying past us in that perfect arrow head formation, faster and more magnificent than anything Hermes might be able to shoot from his celestial bow. They fly past in such perfect formation you could almost believe they were held together with exactly the same lengths of rope to keep them all in line. ‘Look at us’ they say, ‘we are zooming past you and love being up here where the sky is our open road and we can woosh around as much as we like, we are such finely tuned machines and we are here to perform’. 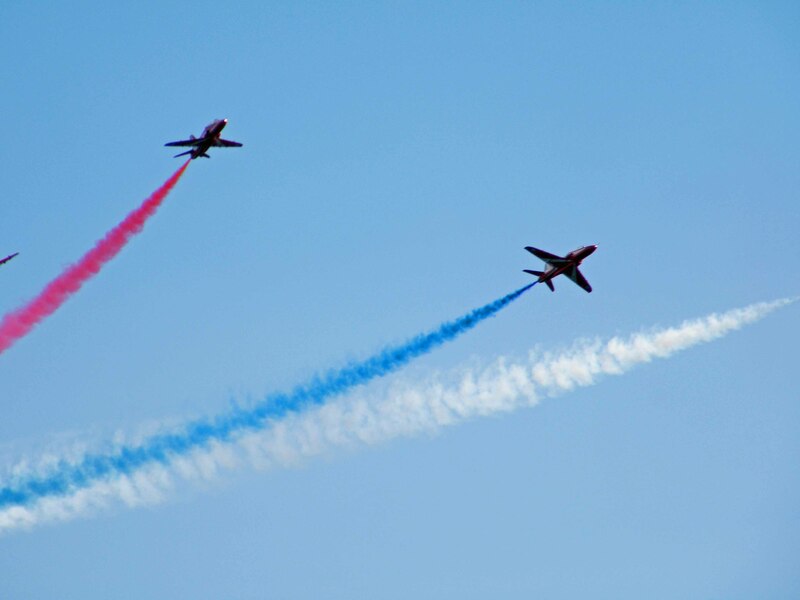 Then two of them break away, I’m not sure where the other five have gone, perhaps for a quick cuppa in the naafi, but the two left behind perform their amazing close to collision aerobatic display. The two planes cross each other’s path, it looks like they virtually touch one another’s wings which of course they don’t but from where we stood, it looked a pretty close thing. 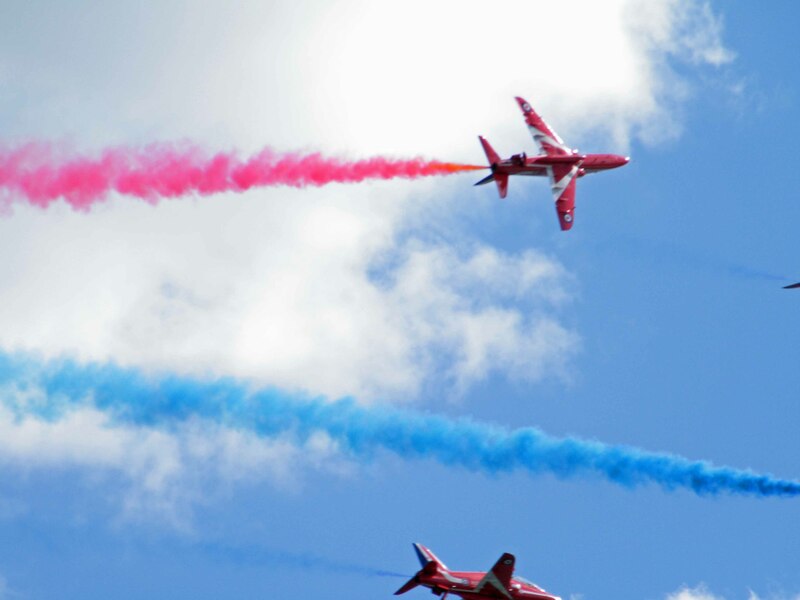 Then there are three of them, the red, white and blue smoke billowing out behind them, criss-crossing with each other so the different coloured smokes mix before floating off and disappearing altogether. 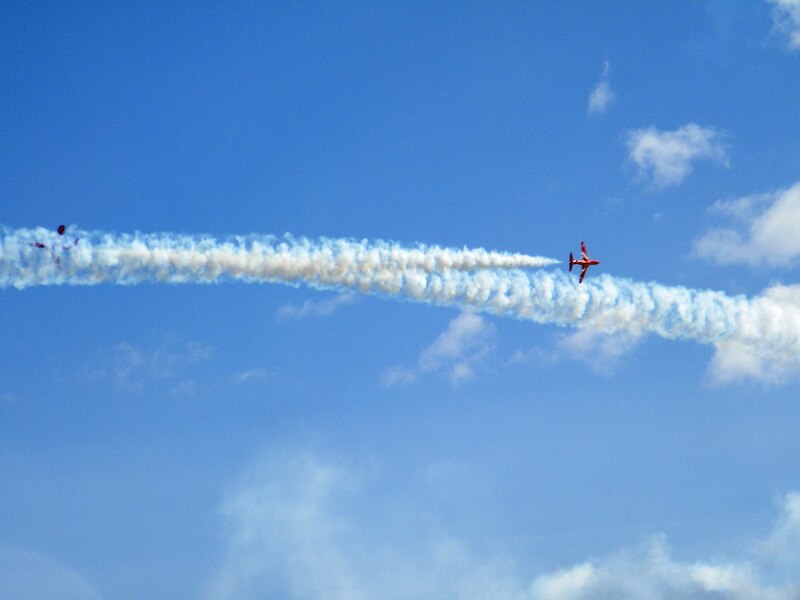 Then they all join up together again, zoom past us, up up up and away straight up vertically into the sky like a rocket. Then an engine stalls, the crowd gasps as the plane tumbles, twisting and rolling as it plummets towards the glassy sea below. Then vroom the engine starts up again. What a thrill a minute! No a second! Each twist, each turn so expertly executed. Just how do they practice that? Every rehearsal must be a full dress rehearsal, no real practice runs, it has to be for real every time. 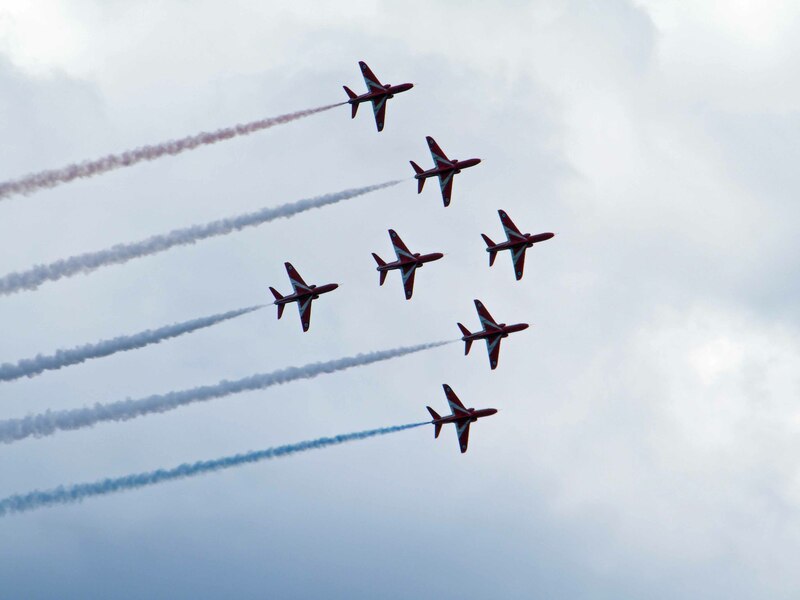 There is something so very breathtaking about the Red Arrows; is it the Top Gun nature of the job, do we girls imagine each pilot to be Tom Cruise and do the boys imagine Julia Roberts. Do we crane our necks to try and catch a glimpse of that mysterious masked pilot, who is like the motorbike rider with their crash helmet on – the attraction lies in what you cannot see rather than what you can; it’s amazing how attractive a pair of eyes alone can be. 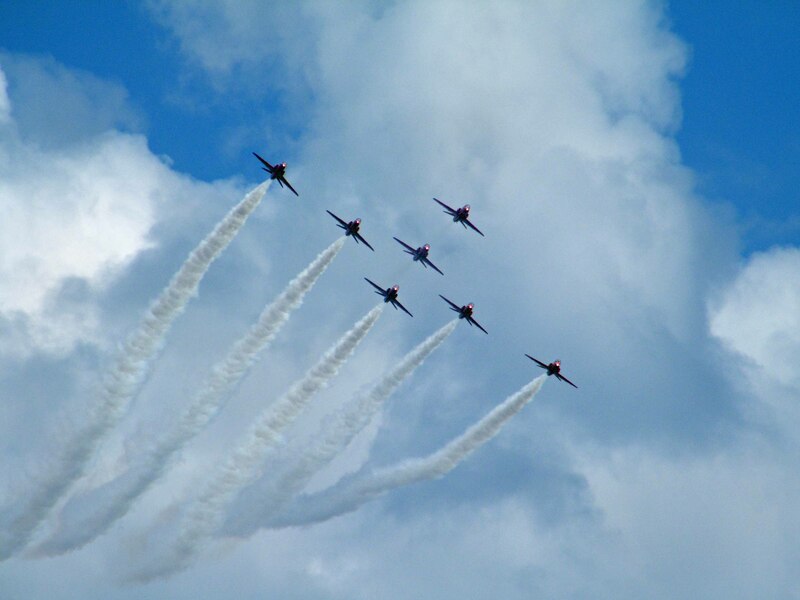 Just what is it that makes the flying aces of the Red Arrows so thrilling? Is it the speed and power of the jet engines, the romantic notion of ‘who is that masked man or woman?’, the feeling of danger that lurks at every climb and each dive? 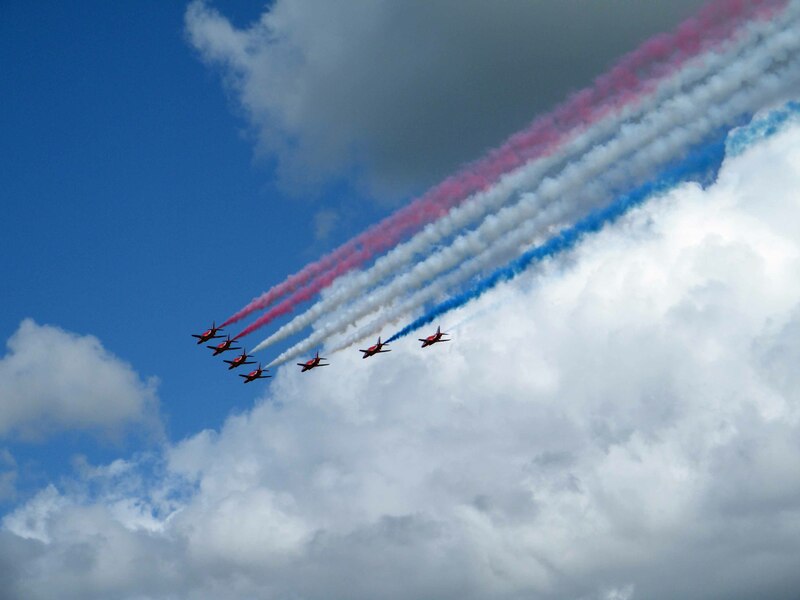 This entry was posted in Special events and tagged aerobatics, air show, beach, display, flying, Lyme Regis, pilot, plane, Red Arrows. Bookmark the permalink.